Manufactured in Chicago and Rock Island, Illinois, the two-wheel drive IHC Farmall had a gasoline engine with four vertical cylinders. It was liquid cooled, had natural aspiration, and used both an oil bath and fibers for air cleaners. It had manual steering and a hand crank starter. 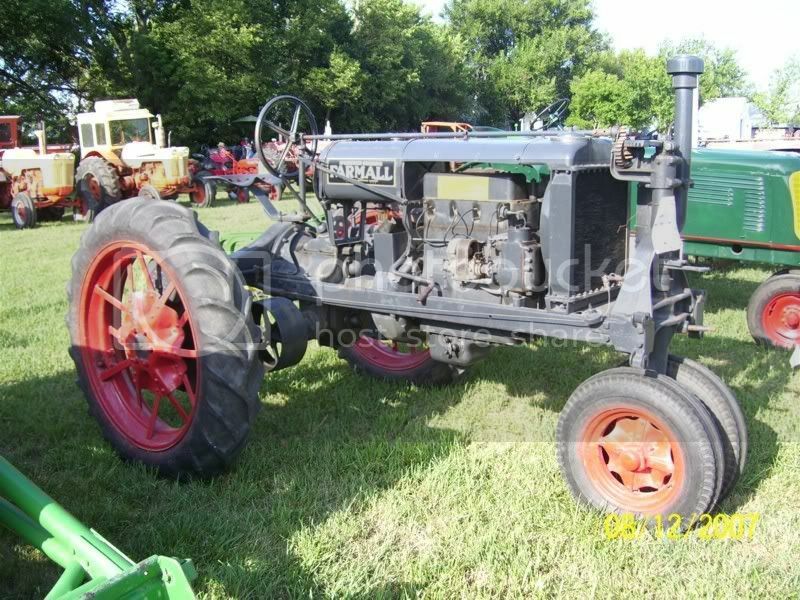 The Farmall weighed approximately 4,000 pounds. It was 11.33 feet long, 7.17 feet wide, and 5.58 feet tall. The Farmall’s transmission had three forward gears and one reverse gear. The fastest speed the Farmall would reach was 4mph. In its Nebraska Tractor Test, it produced 20.05hp of maximum belt power, 13.27hp of maximum drawbar power, and had a maximum drawbar pull of 2,727lbs. I just purchased what I believe is a 1927 International Harvester Regular. There are two rivets on the tool box, but no plate, so I guess I’ll never know when it was built. I said 1927 because that’s what the person who sold it to me said it was. It is in really bad shape; the engine is frozen and all rusted. It also appears to have been painted red. I am finding spots of red all over the entire tractor. Perhaps that will help determine when it was built because the pictures that I have seen so far have all be a grayish color. I would like to restore it. Anyone have any suggestions as to how to get started? It is on rubber; the two front are holding air and the right rear is also holding air, but the the left rear is shredded with a black snake living in it, or it was when I brought it home. I need to replace that rear tire so that I can move it around. I know that much at least. Thanks in advance. I forgot to mention that it has a PTO shaft. Try looking on the top of the frame on the left side of the tractor just under the oil bath air cleaner, mine is 77651 which makes it a 1930 model. All regulars were painted gray with red wheels, IH started painting their tractors “farmall red” about 1936. The regular had an open fan gear steering, in 1932 when the F20 came out to replace the regular it had an inclosed steering gear up front. am looking for air cleaner,starting tank and holder,3 way sediment bowl,gas cap, radiator louver, connecting rod from magneto to control lever for regular, any help will be appreciated. Where can I find new pistons and sleeves for my Farmall regular?